An Eviction Notice for Illegal Activity is sent by a landlord within a time-frame dictated by each State to inform the tenant that they shall have to move-out due to an illegal act committed on the premises. 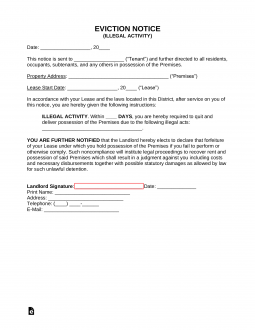 This type of notice is not curable, meaning, the tenant has no choice but to remove themselves from the premises or face a legal eviction by the landlord (known as a forcible entry and detainer). Unusual activity – Can be constituted as unpleasant or unusual odors, high traffic of visitors in and out of the property, excessive usage of utilities (the landlord or property management company can review the meters for unusual spikes or usage), the tenant has only made rental payments in cash. Complaints from neighbors – Complaints from neighbors should be documented at all times with all detail possible in the event it may be utilized later. Landlord or property management company will need to remain objective and research the issue in order to take appropriate action. Receiving a signed letter from a neighbor, depicting the issue and complaint will assist in supporting future claims. Based on information gathered by the landlord or property management company consult with an attorney to determine next legal steps. Of note, ensure the information is not discriminatory; the landlord should review the information in detail to identify potential of religious, racial or a disabled individual being targeted in particular. Discriminating against a tenant could hold the landlord liable and be cause of termination from the tenants perspective, along with a potential suit. Dependent on the type of activity identified, a specific division within a Policy Department may be contacted and require further information (i.e. Narcotics Division). However, should local law enforcement agencies deem an arrest is appropriate, the tenant is not automatically evicted. The landlord or property management company can acquire records of arrest along with any complaints filed by the neighbors to help facility an Eviction Notice. Due to Eviction Notice being in relation to illegal activity, the process may occur quicker than a traditional eviction. The local tenant/landlord laws should be consulted to determine the appropriate delivery method for a Notice to Quit. Dependent on the state, some states may allow the Notice to Quit to be sent through the standard mail or first class mail, posted to the property, or it may be left at the property rented. Other states require that the Notice to Quit is delivered through a formal delivery and therefore tenant must be served. Payment to the appropriate state martial must be made in that case. What are common types of illegal activity that can trigger an Eviction Notice? The tenant has allowed controlled substances on the premises of the property (drugs). In addition, the use, sale, manufacture or distribution of controlled substances. The tenant has allowed prostitute related activities to occur on the property or has allowed prostitution. The tenant has unlawfully possessed a firearm that resides on the property or has unlawfully used a firearm on the premises of the property. The tenant has obtained stolen property or property acquired through a robbery on the premises of the property. The tenant has shown evidence of violence, harassment, verbal abuse or made threats. The tenant has completed the application process fraudulently. Can an illegal activity occurring off the property be a cause for an Eviction Notice? Illegal activity occurring off the property can be cause for Eviction. However, this is dependent on local state laws and if the Rental Agreements listed clauses and covenants advising tenants to refrain from such activity on or off the property. The tenant will remain responsible for all terms and conditions as listed on the rental agreement, inclusive of paying rent until the lease has been terminated in full. Can medical or legalized marijuana be subject to an Eviction Notice? The legality of Marijuana is dependent on state and federal laws. Currently Marijuana is illegal at a Federal level however medical and recreational Marijuana is available in some states. A landlord will want to consult with legal counsel to ensure they are not discriminating against those who may need it medically and what clauses can be added to ensure illegally possessed drugs are still being addressed in the rental agreement.